Steve Rice (Olympia, United States) on 22 November 2012 in Art & Design. 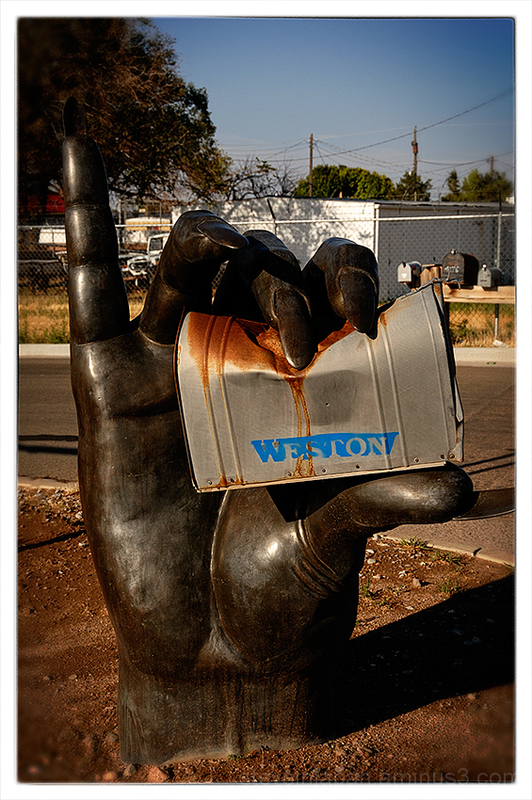 This bronze hand is to be found at this address in Santa Fe, NM. A great idea. The sculpture is very life-like. That is freaking awesome! Seriously... I love this series! Fabulous - however, scary for the mail man! Ah, yes, the studio and foundry have a fine reputation there ! Diese Skulptur sieht auch sehr gut aus. Kind of scary - but amusing too. Happy Thanksgiving. quelle compo cette main et la grosse canette sueprbe. A great "find." Amazing that someone would go to the trouble of casting an item this large for a mailbox post! what a cool find, very unique. A beautiful sculpture, and a good framing. The light is beautiful. Great shot. I want that in my yard, but wait I don't have a yard I live in an apartment. i'm guessing this is someone's mailbox.. :D nice shot! That is so cool; great photo! Happy Thanksgiving! Wow what an amazing shot! I've never seen that before. When were you there? Excellent find of this original sculpture. I like the posture of this hand very much!Though it seems odd to be placed there. It's lovely! haha, airport road? I wonder if the artist had a bad experience with flight delays/lost luggage? :-) Great shot!